Your first visit to the cancer centre is a time when your cancer care team gathers all your medical information to treat your illness, as well as any other information that may be needed to help you and your family with cancer treatments. Make a list of all the medications that you are taking or ask your pharmacist to print you a list to bring with you. You should include any over-the-counter drugs, vitamins, supplements, creams, herbals and alternative medicines. Please also include the name and numbers of your pharmacy. Bring your MCP (Medical Care Plan) and hospital card as well as the name of your insurance provider. Make a list of all allergies and the type of reaction that you have. Bring a family member or support person to your appointment to help take notes and ask questions. Tell your health-care provider if you have had any recent falls or if you use any assistive devices (canes, walker, hearing aid). Name and number of your family physician or nurse practitioner. A list of questions you may have for your health-care team. Any forms you may need completed by your physician or member of the health-care team (examples: insurance, absence from work, forms that confirm your visit for the day). Bring something to do while you wait (e.g. reading, puzzle book, etc.). Cash or credit card for parking. If you have a living will or Advanced Health-Care Directive, please bring a copy with you. A Patient Passport (PDF) is a small booklet where you can keep important information about your health history, treatments, appointments and medications. You will receive a Patient Passport when you register, or if you have one, please bring it with you. When you arrive for your appointment, please check in with the receptionist . When you register, you will be asked for your full name, date of birth, address and your family physician’s name. You will then be offered a seat in the waiting room to wait for your appointment. While you are waiting, you will be asked to fill out a short form with questions about how you are feeling and any concerns that you may have. Please bring the form in with you to see the nurse and the physician. A staff member will call your name and take you into an examination room where your height and weight will be measured by a nurse. The nurse will talk with you about how you are feeling and any concerns that you have listed on the form. You will then meet with your oncologist who will talk to you about a plan of care and outline what will happen next. The physician will want to look at the area of your body where your tumor is, or where you may have had surgery. Treatment, if necessary, may not begin at this visit. Other visits may be necessary depending on the type of treatment you need. Learn more about the cancer care team. If you do not understand what the team is telling you, or if you have any problems hearing, please advise one of the members in your health-care team. They will arrange interpreter services if you have difficulty speaking English or use sign language to communicate. 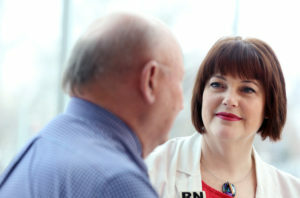 There are also cancer patient navigators who are available to help. We want to know how you are feeling and coping with your cancer. While you are waiting to see the physician you will be asked to fill out a form that will let your team know if you are having any discomfort or concerns. You can ask a family member or a staff member to help you fill out the form, and the nurse will talk to you about it. By letting us know what is on your mind, we can share information about services or resources that are available to help you. The information you provide will become part of your health record and will be shared with other members of your health-care team. Learn more. Advance care planning gives you an opportunity to think about your values, beliefs and wishes for care. It is important that you talk to your family and loved ones about your future health and personal care wishes in case you become unable to speak for yourself. Having the conversation is a way to give your loved ones peace of mind in making decisions about your care and treatment during a difficult time. Learn more about Advance Care Planning. If you are a smoker, your health-care team will talk to you about becoming smoke-free. Quitting smoking is one of the best things you can do to help make your cancer treatment work best. Also, side effects from some of your treatment may be less pronounced if you are smoke-free. By quitting smoking the side effects from some of your treatments may be less. It’s never too late to quit and we are here help to you!